Hi there, I am sure you have all watched the terrible and traumatic times Haiti has witnessed recently. You cannot help but feel for their immense pain and suffering as well as rejoice when you hear miraculous stories like the most recent one about the girl they found alive after being buried in the rubble for the last 15 days. I am so proud to be associated with a company that cares and takes action whenever there's heartache and help is much needed. 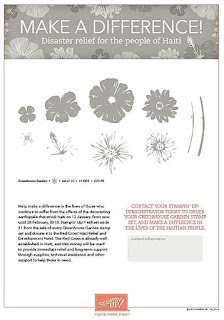 From now until 28 February, 2010, £1 from every Greenhouse Garden stamp set sold will be donated Red Cross’ International Response Fund. The Red Cross is already well-established in Haiti, and this money will be used to provide immediate relief and long-term support through supplies, technical assistance and other support to help those in need. 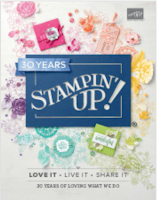 A lovely way to make a difference and help those in need, and what a beautiful set they chose, I adore this set myself and I will match Stampin'Up! 's kind gesture by donating a further £1 to the Red cross Fund from each sold set. The colours are Pink Passion, Summer Sun and Chocolate Chip. 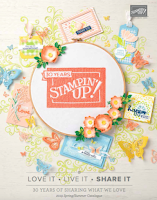 This set is a 2 step stamping one and I have set myself a modest challenge of selling at least 5 sets which I think is very do able/ BUT if I double this by the end of Feb and I end up selling 10 I will add every person that purchase this set from myself into a draw and one lucky winner will receive a £25 Stampin'Up! voucher. In adition to that everyone purchasing this set from myself will get the following class for free. Thanks for the lovely demo tonight at Dorothy's. Hope you got home safely. 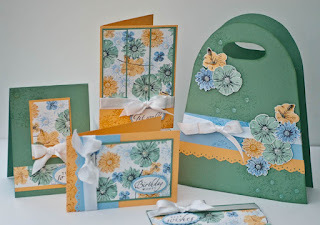 wow, your card is fabulous....great colors...I will be purchasing the set that will go to help...I think here in the US we have a different set...thnaks for sharing, I hope you have a great week!